Julie coaching young people from Amber Valley and Erewash AC. 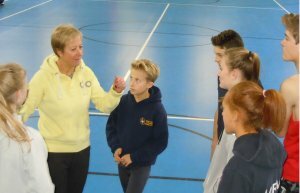 Julie Feeney, 55, from Belper, is a part-time swimming teacher and athletics competition deliverer - organising and running school sportshall athletics and QuadKids competitions, including the Derbyshire School Games - who is now on the Coach Academy programme of the Derbyshire Insititute of Sport (DIS). "I first got into coaching through my eldest son, David, who was talent spotted in a schools sportshall athletics competition in 1998 when he was 11. 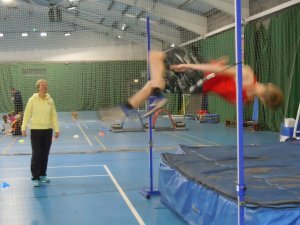 "There was no local athletics club pathway for these talented children, so Amber Valley Borough Council's sports development unit asked for parental support in setting up a club (Amber Valley AC - now Amber Valley and Erewash AC - then based in Loscoe). "My husband Jim (a runner) and I fancied getting involved and we have both taken key volunteer organisational roles from the start and still do to this day. I have been club secretary from day one and had a steep learning curve about the sport and how to run a club. "I took my coaching qualifications not long after this. David and our other two children (all in their 20s now) all still compete, and David and Louise both coach at the club themselves now. Funnily enough, I went on to be employed part-time for AVBC SPU as their athletics development officer for 10 years. Overseeing a high jump session. "I was hesitant at first about getting involved in athletics coaching because of all the swimming teaching I was doing, especially as I had my own swim school for a while. "However, I couldn't sit back and just watch, especially as I was going with David all over the Midlands for him to gain extra coaching because for the first six years of the club's life we trained on a playing field and had no track to use. "I picked up so much by watching other coaches and their athletes. I now limit myself to coaching high jump, sprint hurdles and 400m hurdles, and S&C. "The club has been based at the Rutland Sports Park track, Ilkeston since 2006 and that's where all our coaching sessions take place. I usually coach four days a week, plus competitions most weekends too. "I was a competitive swimmer in my teens with a club in Grimsby. I was an OK swimmer – including county titles - and always in the club team. "It taught me so much – discipline, self-reliance, love of being sporty, handling pressure within competition, disappointments and winning steaks in equal measure, a social life away from school... and a geography of the UK going all over for competitions! "After I finished swimming competitively I turned my back on the sport for a while. I'd had so much of ploughing up and down a pool it held no interest for me until I saw an opportunity to retrain as a swimming teacher. "I thought it would fit nicely around the young family I had at the time. I enjoyed it so much I have taught ever since in various pools around the county. 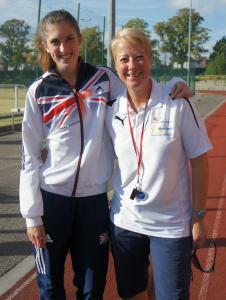 Julie with former charge and now Derbyshire Insititute of Sport athlete Jess Turner. "In terms of skills I've picked up, I've learned that swimming and athletics are very similar in that you need to develop a 'coaching eye' to break down the smallest action or body position and make changes to bring about a better movement or pattern. I've certainly developed patience, positivity and diplomacy too. "The best thing about coaching for me are the interactions with the athlete... being able to suggest a change in their movement pattern that brings about an instant improvement in technique. It still gives me a bit of a buzz. "Building relationships and friendships with athletes, fellow coaches, parents, officials is also something I enjoy. "I've been involved with the Derbyshire Institute of Sport (DIS) talented athlete programme from almost the beginning and seen how it has developed over the years into an influential and sought-after programme. "Jess Turner (400m hurdles) was one of the first athletes selected onto the programme. I coached her to her gaining her first Great Britain selection in 2013 - and I'm now beginning to appreciate the similarities and differences in coaching across other sports on the programme. "I'm also grateful for being given the chance to be on the DIS's Coach Academy programme. Many younger people have the opportunity to take sport or coaching as a university course and later, a career. "That was never an option when I was younger as that type of degree was unheard of then. I hope to learn more about coaching in general and not just the technical aspects involved in athletics." 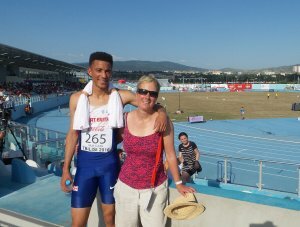 Julie with another of her coaching successes, Alex Knibbs, in Tbilisi at the European Youth Championships in July 2016. "Behind every sports person of any level there is a coach and a club. Without them there would be no sport outside school. "Helping athletes make improvements in their chosen sport is what keeps me motivated. Being with young people is enjoyable and rewarding and I love seeing them do well. "The fact is you never stop learning. I'm still picking up tips or tracks from other coaches I see or hear about. I'd recommend anyone to try coaching and see if they get something from it."